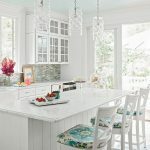 I adore the precious shabby chic vibe of this kitchen. It makes me happy,too! ADORABLE, Erin!!! I loved it too!!! Talking about school, I feel the same! Today is super special because my son just left for his first day in University… SO, yes, I am feeling nostalgic, too… I wanted to pack him a lunch… with Goldfish for snack, lol! Thanks for the shout out! This was such a delight to discover! 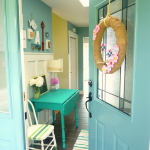 Love the pops of color in this home…so bright and cheery!! The cupcake flags are too cute!